Dr. Bibiano “Boy” Fajardo explains traditional Hilot to the administrative staff of the UP Colllege of Arts and Letters. 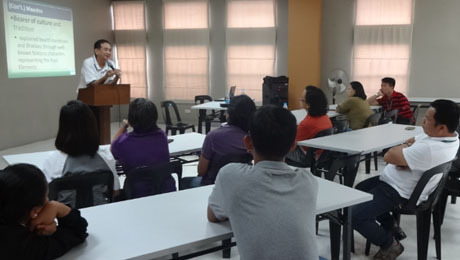 QUEZON CITY, Philippines- Dr. Bibiano “Boy” Fajardo gave a brief lecture-discussion on traditional Hilot for the administrative staff of the UP College of Arts and Letters (CAL) on May 29, 2014 at Sulod Tagibanwa. The activity was organized by the CAL employee’s cooperative on the heels of a similar presentation that Dr. Fajardo gave to the faculty of the Department of Art Studies in Matabungkay, Batangas. After going over the philosophy, concepts, and principles behind traditional Hilot healing, Dr. Fajardo welcomed questions from the participants. The questions raised ranged from simple topics such as the effectiveness of herbal medicine, to the more mystical aspects of traditional healing, such as diagnosis using tawas. Dr. Fajardo also shared practical and useful tips on how to maintain health and prevent simple ailments such as the common cold, as well as dreaded diseases such as cancer. When the discussion was done, the participants gathered around Dr. Fajardo and took turns having their overall health assessed the traditional Hilot way. One of them also had her young son checked, because he was suffering from pain in his foot. Dr. Fajardo evaluated the child’s foot, then taught the mother how to do Hilot on the area, because the condition would need regular Hilot over a longer period to be fully resolved. It was an interesting and educational experience for the CAL administrative staff, who learned about traditional Hilot, as well as how to maintain their health. Do you want to learn traditional Hilot healing?